Isn’t it always the way? You get sent back through time by computer overlords trying to prevent a human uprising, you get yourself a perfectly good human suit to wear over your robo-skeleton (plus a heavy Austrian accent, for reasons only the computers know for sure), you’re sort of blending in with the people of the past, and then bang! You get a tear in your false face and all of a sudden the jig is up. It’s hard to fool anybody when you have a red, digital eye and a visibly metallic skull on full display. So much for the subtle approach! You can declare your allegiance with the machines in this officially licensed Terminator endoskull appliance. The lifelike latex facewear measures about 4 inches in diameter and attaches to your face with spirit gum (sold separately). 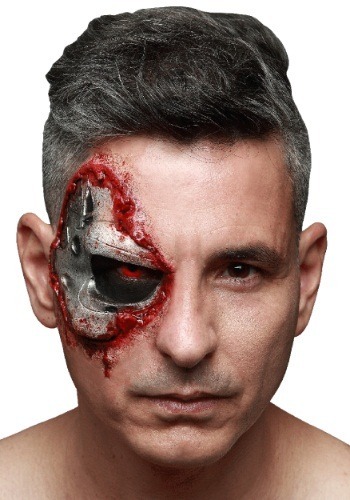 It’s a striking replica of the battle damaged look sported by Arnold Schwarzenegger in the first Terminator movie, and it’s sure to put some fear into the hearts of any aspiring human revolutionaries at your next costume party.